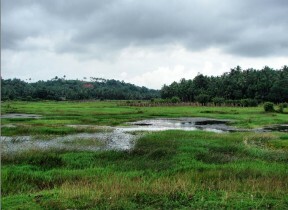 A marshy habitat of the species in the state of Kerala, southern India. Native to Sri Lanka and southern India where in the latter it’s restricted to Kerala and Tamil Nadu states plus the Union State of Puducherry (formerly Pondicherry). A subspecies, H. a. brittani, was described by Devi and Menon in 1992 from Pathiramanal Island, Vembanad Lake, Kerala but was brought into synonymy by Menon just a year later. 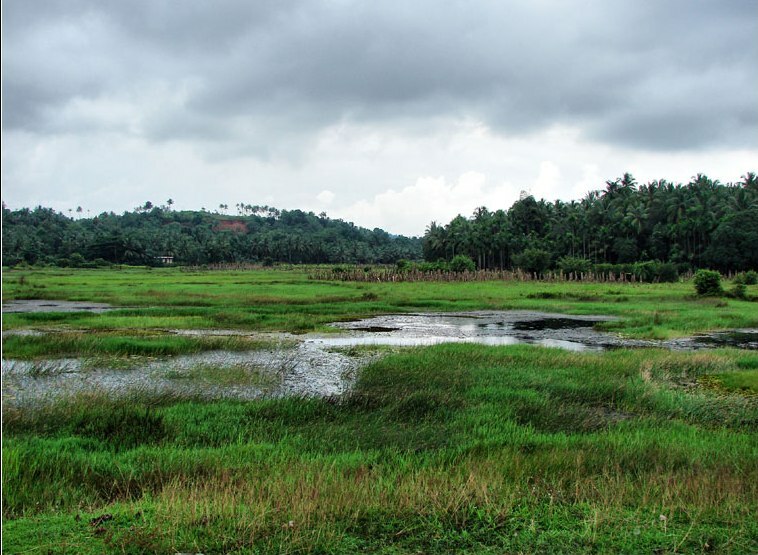 Apparently shows a preference for sluggish and still waters such as rice paddies, swamps and weedy ponds, tending to be most common in flood plains and other lowland areas. It’s also been collected from ditches with dense growths of submerged vegetation. In Kerala species inhabiting similar environments include Carinotetraodon imitator, Laubuca dadiburjori, Aplocheilus parvus, Pseudosphromenus dayi and P. cupanus. A group is best kept in an aquarium with base measurements upwards of measuring upwards of 45 ∗ 30 cm. Best kept in a densely-planted tank and is an excellent choice for the carefully-aquascaped set-up. The addition of some floating plants and driftwood roots or branches to diffuse the light entering the tank also seems to be appreciated and adds a more natural feel. Filtration should be relatively gentle. Chiefly a micropredator feeding on small insects, worms, crustaceans and other zooplankton in nature. In the aquarium it will accept dried foods of a suitable size but should not be fed these exclusively. Daily meals of small live and frozen fare such as Daphnia, Artemia, Moina, etc., along with good quality flakes and granules will result in the best colouration and encourage the fish to come into breeding condition. It also makes an ideal companion for shy anabantoids such as Sphaerichthys, Parosphromenus or the more diminutive Betta species and in a planted set-up can be housed alongside freshwater shrimp of the genera Caridina and Neocaridina. It’s a schooling species by nature and really should be kept in a group of at least 10-12 specimens. Maintaining it in decent numbers will not only make the fish less nervous but will result in a more effective, natural-looking display. Males will also display their best colours and some interesting behaviour as they compete with one other for female attention. Mature females are noticeably rounder-bellied and usually larger than males. 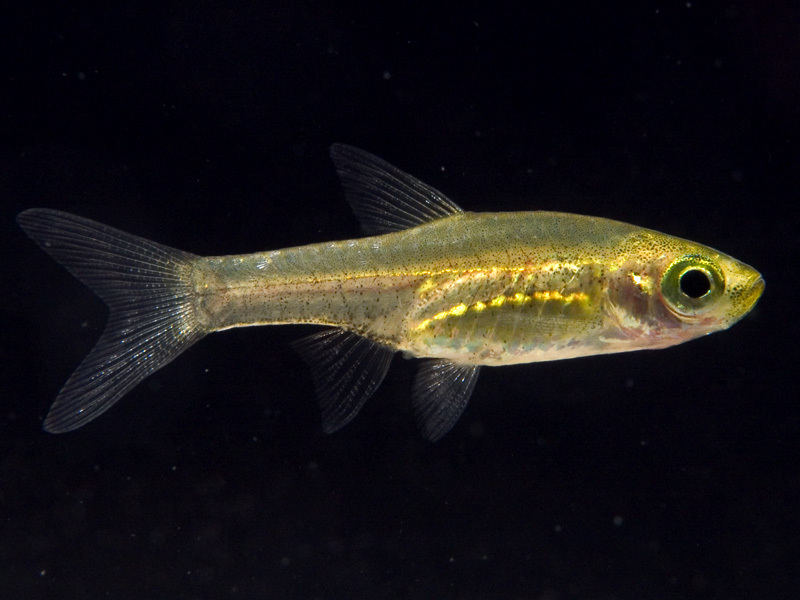 This species hasn’t been bred often in aquaria but the few reports that do exist suggest it’s not too difficult. Like many small cyprinids this species is an egg-scattering, continuous spawner that exhibits zero parental care. That is to say when in good condition and in the presence of both males and females eggs will be laid regularly. In a well-furnished, mature aquarium it’s therefore possible that small numbers of fry may start to appear without intervention. However if you want to increase the yield of fry a slightly more controlled approach is required. The adult group can still be conditioned together but one or more smaller, say 10 – 15 litre, containers should also be set up and filled with aged water. A decent-sized clump of Java moss or other fine-leaved plant should also be added filling perhaps half the available space. Neither lighting nor filtration is necessary although you can install a small air-powered sponge filter if you prefer. A small group or single pair of adults can then be introduced. The eggs are only mildly adhesive, tending to fall to the base of the tank from where they can easily be siphoned into a separate container using a length of air line or similar. Alternatively the adults can be removed once eggs are spotted. Incubation usually takes between 47 – 54 hours (Sado and Kimura, 2005) with the fry initially requiring microscopic foods such as Paramecium until big enough to accept Artemia nauplii, microworm or dried products of a suitably fine grade. The genus is monotypic and distinguished from other cyprinid taxa by a combination of a moderately compressed, elongated body with two rows of teeth on the lower pharyngeal (throat) bone and lacking barbles, visible lateral line and a symphyseal knob on the lower jaw (Talwar & Jhingran, 1991). Its small adult size evolved via a process known as miniaturisation characterised by sexually mature adults with a significantly reduced size of less than 20 mm SL. 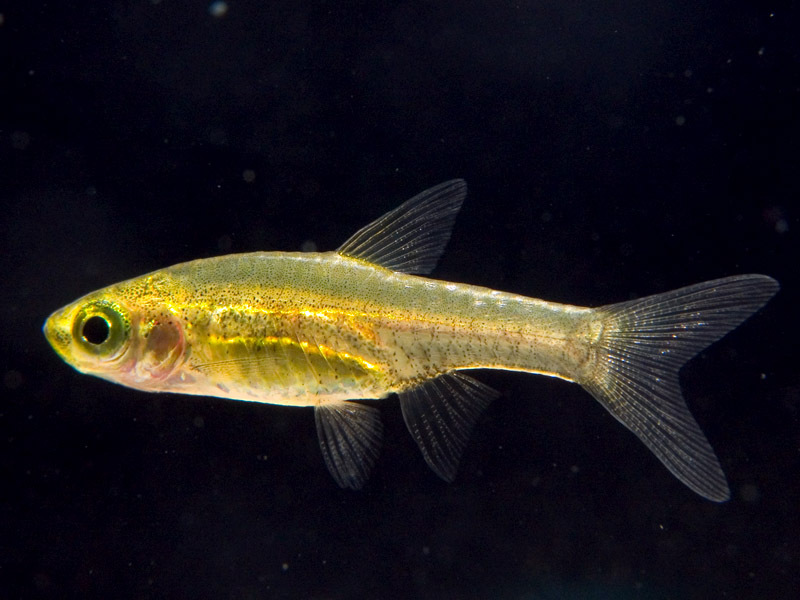 Among bony fishes cyprinids are one of the few groups in which this phenomenon occurs repeatedly with all Barboides, Danionella, Microdevario, Microrasbora, Horadandia, Boraras, Paedocypris, Sawbwa and Sundadanio species representing miniaturised taxa along with a few members of Danio, Laubuca and Rasbora. All show a preference for still or slow-moving waters, often in nutrient-poor habitats such as forest peat swamps. The anatomical structure of miniaturised cyprinids can vary greatly; there are two principle ‘groupings’ with some species possessing intermediate features to some degree. The first contains those fishes which though small are essentially proportionally dwarfed versions of their larger relatives e.g. Barboides, Microdevario, Microrasbora, Horadandia, Boraras, Sawbwa, Sundadanio, Danio, Laubuca and Rasbora. The other includes those in which anatomical development stops at a point where adult still resemble a larval form of their larger ancestor i.e. Danionella and Paedocypris. The latter are usually referred to as ‘developmentally truncated’ or ‘paedomorphic‘ and are thought to have evolved via a process known as ‘progenetic paedomorphosis’ i.e. paedomorphosis brought about by accelerated maturation. They typically exhibit a simplified skeletal structure along with species-specific morphological peculiarities such as the tooth-like projections in male Danionella dracula. Britz et al. (2009) consider that developmental truncation may have facilitated the development of such novelties ‘by freeing large parts of the skeleton from developmental constraints, dissociating developmentally linked pathways and creating a greater potential for more dramatic changes’. Following Liao et al. (2009) Horadandia is a member of the rasborin sub-group within the subfamily Danioninae (the other sub-group contains the danionins). This group is further subdivided into six clades (clusters of closely-related species) of which H. atukorali is included in ‘clade three’ alongside Boraras brigittae, Rasboroides vaterifloris, Trigonostigma heteromorpha and three species previously included in Rasbora but moved into new genera by the authors; Trigonopoma gracile, T. pauciperforatum and Rasbosoma spilocerca. Of these it was found to form a monophyletic group with Rasboroides meaning these two probably derived from the same common ancestor. The results for B. brigittae and T. heteromorpha were found to be inconclusive in some respects and further work regarding their phylogenetic position was recommended. 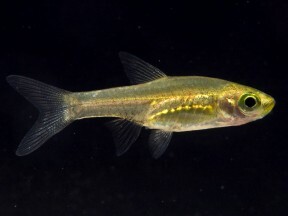 Danionella priapus, a new species of miniature cyprinid fish from West Bengal, India (Teleostei: Cypriniformes: Cyprinidae). Extension of range of distribution of Horadandia atukorali Deraniyagala (Pisces: Cyprinidae: Rasborinae) to Pondicherry and Tamil Nadu. Developmental morphology of the cyprinid fish Horadandia atukorali.